Before heading out to Boston today, Bassam and I wanted to stay in Maine a little bit longer and visit the community in Portland. We learned there was a fairly large refugee population from Iraq, Somalia, Afghanistan and Sudan. Why Maine? The United Nations helps refugees relocate to the United States and often sends them to Maine because it’s a state with a slow growing population that’s known for having welcoming and friendly communities. One of the men who immigrated to Maine recently was Faisal, an Iraqi who runs a halal meat butcher shop downtown. 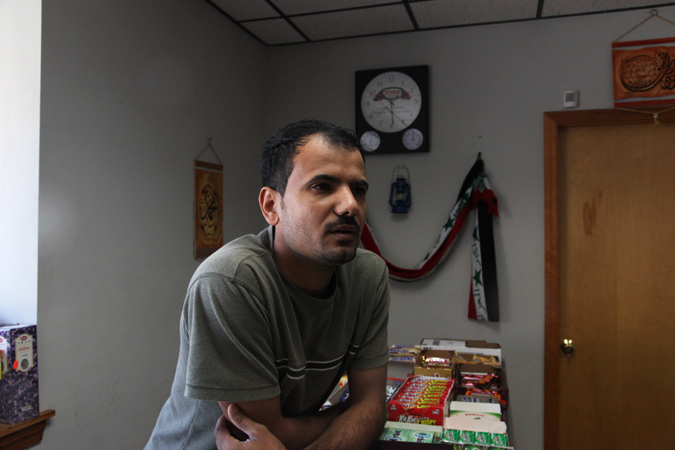 Faisal came to Maine about three years ago after his life was too dangerous in Iraq working as an interperter for an American contracting company. Now he and his colleague (pictured below cutting meat) make a living running Sindibad Market, aptly named after the Sinbad the Arabian folktale sailor. 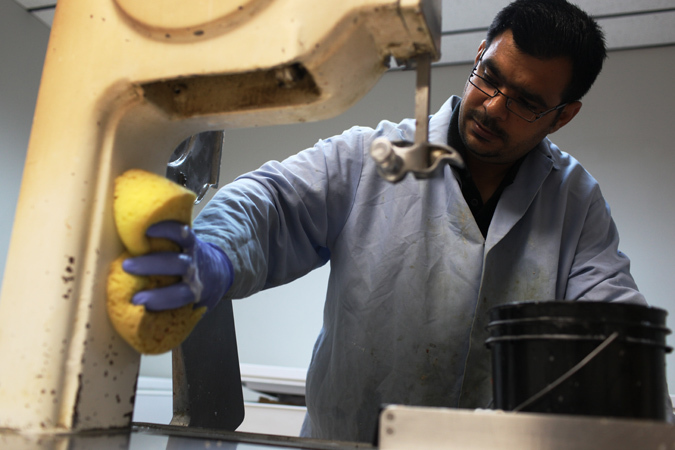 Mishan, an Iraqi refugee, cleans the meat cutter before the start of the day. Mishan arrived in Portland less than a month ago. I looked around the store and got a chuckle after finding a shelf of Fair and Lovely cream. 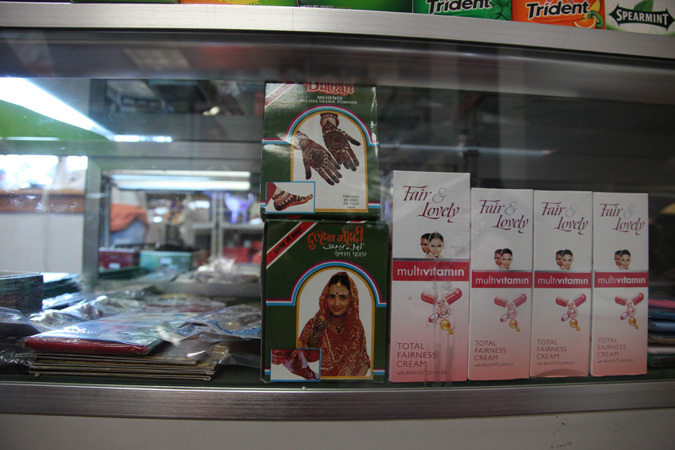 It’s a skin bleaching cream that’s popular among the South Asians and other cultures. It’s sad but many foreign cultures view people with lighter skin tones to be more beautiful than people with darker skin, and some people will go to the ridiculous length to use this cream to bleach their skin. Faisal left Iraq because he said criminal militias are runng the streets. He and his wife would take turns escorting their kids to school because it was just too dangerous for them to go alone. So in that sense, he’s relieved his kids can go to school in Maine in a safe and welcoming environment. Faisal, the owner of Sindbad Market, leans on the counter while speaking with Aman. Faisal also talked about how there’s a pretty active mosque in Portland, which because of time we unfortunately didn’t have time to visit. 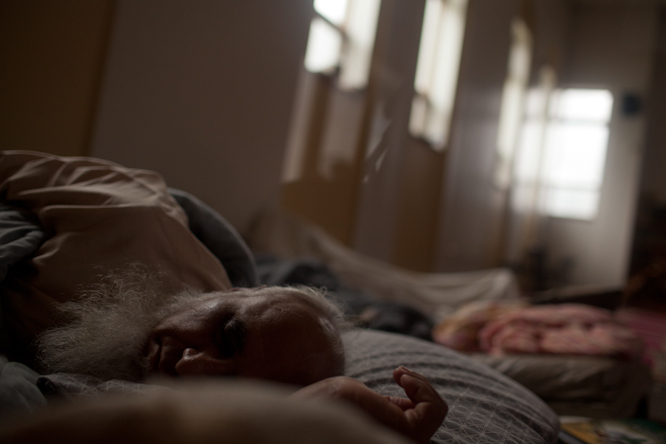 The mosque is populated primarily by Iraqi and Somali refugees. So I said “Wow, I’m sure you guys have the best food at Ramadan dinners.” Sadly, no. 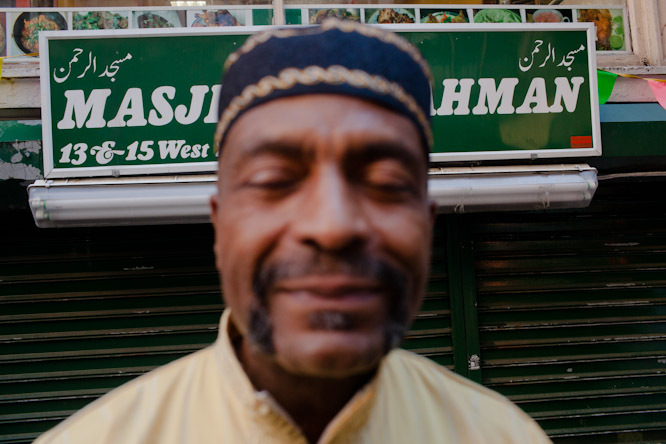 Like many Muslim communities across the country, the groups are segmented. The Somalis have their own meat shop and get their groceries there, and the Iraqis come to Faisal’s. We were getting ready to drive out to Boston when we passed by a playground. Turns out it was a community center catered to the needs of refugees living around the housing projects. Here, most of the refugees are from Sudan. 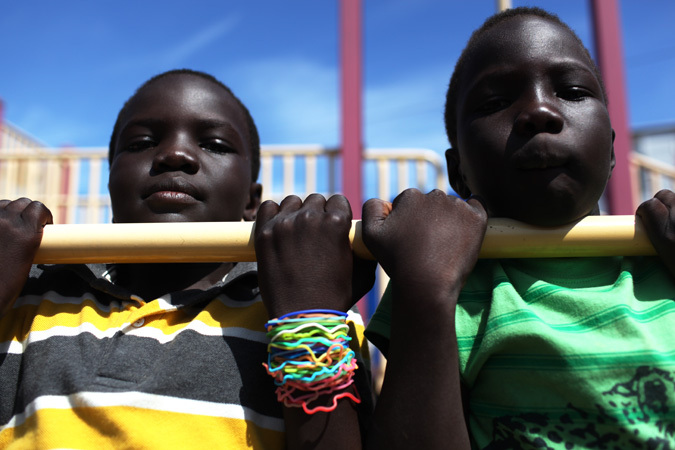 The group the Catholic Charities of Maine works with the U.N. to bring families from war torn countries to the states. 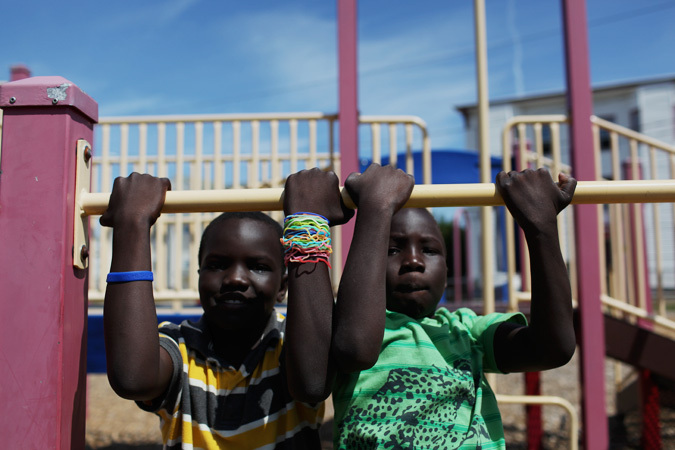 I spoke Alfred Jacob, a Southern Sudanese refugee who runs the center, while Bassam juggled between taking photos of the kids playing soccer and trying not to get kicked in the head with a ball. 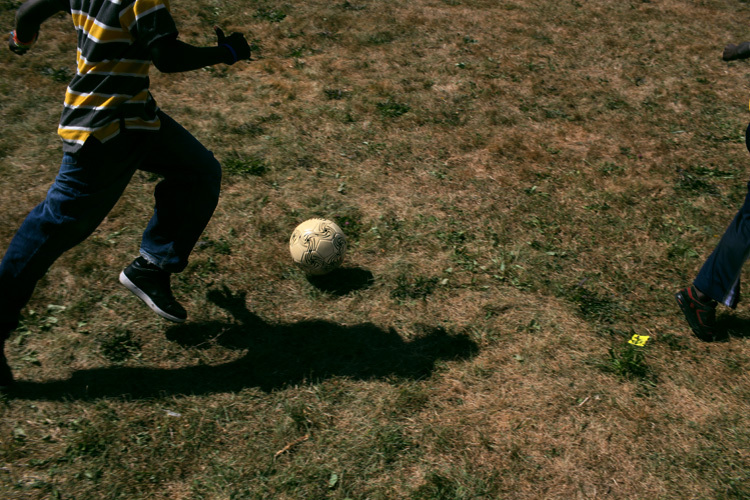 Sudanese refugees play soccer in a playground of a housing project in Portland. A friendly push-up competition in the playground. Your investigation are very useful and this grass root journalism is really needed in the community. Good work! MashAllah! I love reading about y’all’s adventures! Excellent story about our melting-pot of a nation, even in small-town USA. Small town? Portland is our biggest city! And our most diverse! And… a lot of other things. I live three hours northeast of Portland and even my city of around 6,500 is not considered “rural” by Maine standards. Interesting to consider the criteria used for choosing where to relocate refugees. Welcoming communities are certainly important, but what an adjustment to go from the dry, seering heat of Iraq, Somalia, Afghanistan and Sudan to the frigid winters of Maine. What a shock. Safe journey and best wishes on your discoveries across the US. You’re doing a great thing! Nice story and beautiful pictures keep up the good work,and stay safe.Good luck. Wow – this was cool to read. I have often wondered about the life of the rescheduled refugees in Maine. It is really insightful to have your firsthand view of it. Thanks for sharing! Look forward to learning from your next travels. Lol, just so you know, that’s called a pull up, not a push up. Hey guys, the people in Augusta travel all the way to BOSTON to get Halal meats right? Why dont you connect them with the people in Portland? 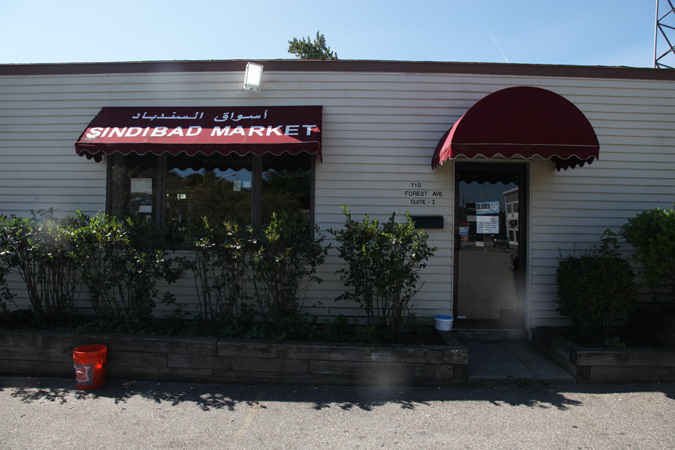 Theres at least two Halal meat places in Portland, that way they can save time, money, and have options. One of my friends posted this website on facebook, and I have to say I’m really excited that you guys came to Maine. If I had been home from camp by then, I would have been glad to wish you a Ramadan Mubarak (is that right?)! I’m glad you liked our city and I hope you visit again and have a longer chance to look around. A friend of mine LOVES Sun Oriental, a Korean market on Congress Street. She says a lot of the products are halal, which is really cool! There’s also some places on my way home that I’d love to look around in, but I’m always too nervous, lol. Anyway, there’s a great Muslim community here, as I know from having gone to Portland High School, and I can say with confidence that should you ever be interested in learning about the Jewish community here, you would be welcome with open arms. As long as you are willing to teach me a bit more about Islam. I’ve enjoyed the posts here so much! It’s quite refreshing to read about Americans HELPING Iraqis instead of treating them as badly as has been reported lately. And it’s ironic that, although I’ve lived in Massachusetts for the last 30 years, I was born and grew up in Portland Maine, and the stark differences in pleasantries from people who publically service us (grocery store clerks, waiters, etc.) has been quite noticable to me for quite some time whenever I come home to visit. These posts and images validate the kindness so apparent in the people of Maine. I hope you enjoy living in Maine, as much as I did as a young girl. Best of luck to you all. i love this post – it makes me homesick for my hometown portland. i am not muslim myself, but i am so touched and proud to hear how people in portland are treating members of the muslim community with respect and kindness – as you would hope everyone would treat everyone. i wish it were that way in all towns. thank you for sharing your project online! i am enjoying following along. I’m a regular whatever non religious kind a guy and i love that you guys are doing this trip. It’s so refreshing to see people handing out love rather than hate or negativity or apathy. i was crying by the 2nd day on the trip. I hope you all keep to do this trip. It is one of the few good things i see on a day to day basis, and im very thankful for that. So even though i ain’t religious, my prayers or whatever they are, thoughts, go out to you. I exploit my コーチ for informal, comfort and ease convey. I like them!